Seattle is best known for its welcoming and diverse culture, but Kaden cannot seem to grasp the life it offers. When Megan, Kaden’s best friend, decides it’s time to hit the night life, it turns into a night they will never forget. Megan mysteriously disappears and Kaden is the only one invested in finding her. Along the way she meets an unusual ally, Finley, who reveals a world beyond the ordinary streets of Seattle. 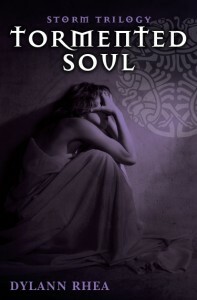 Kaden finds herself pulled into a dark world of fae as the two struggle to locate Megan before it’s too late. I’ve always wanted to write a story about faeries. Ever since I bought the Art of Amy Brown, who is a mind blowing artist. Ever story I started to work on had something to do with faeries. One day I was told by someone I would be a writer, so that got the wheels in my brain turning. I started to really ask myself, “What would I write about?”. That’s when the idea for Tormented Soul and the Storm Trilogy came about. Many of the characters I pulled from different parts of my life. Some remind me of people I know, others of people I wish I knew. A lot of the time though, I embrace the characters within myself while I’m writing. It’s almost like acting in a way except I’m sitting in front of a computer screen.